This entry was posted in Racing on April 27, 2010 by Steve Tilford. I never really liked Vino as a rider. I’m not sure why not. I think it was his riding style. It didn’t seem to fit his body type. Which convinced me he took drugs. Then, when he was declared positive at the Tour a few years back, I wrote him off completely. I don’t have any sympathy or forgiveness for the guys that are caught positive. The drugs that are being used nowadays are “too good” and drastically change the results. My stance is a life time ban. This two year thing is just like a timeout for these guys. It is obviously still condoned or none of these guys would have jobs once their suspensions are over. The podium on stage 2 of Giro del Trentino was nearly comical. It was Ricco winning, Vino 2nd and Basso 3rd. Using my criteria, none of these guys should of even been in the race. So now, Alexandre Vinokourov feels like he wasn’t treated fairly after he won in Liege. So he decides to have someone write his views and publish them. Let me tell you, that isn’t a good way to get back into the good graces of cycling media and fans. You can’t talk someone into liking you. They either do or don’t. For a million reasons. But, his letter didn’t do much for me. What I don’t get about the whole thing is that some riders are accepted back into the sport by the media and fans while others will never be. I think that is the case with Vino. When the Festina affair occurred, Laurent Dufaux and Alex Zülle went into the police station, said “yeh, we take EPO” and left a couple hours later. In the meantime, Richard Virenque swears that he didn’t for the next year. That is until they come up with recorded conversations implicating him. And then under oath he said something like he took 1000 injections that year. Dufaux and Zülle both got contracts the next season after they sat out 6 months, or whatever the penalty was then. I don’t quite remember if Virenque ever had a timeout, but I suppose he did. But, for some reason Dufaux and Zülle’s admissions seemed to make them more likable. David Millar. Everyone seems to like him now. He had so, so many excuses why he took EPO to win the World Championships in 2003. They had to keep in a police station for two days before he admitted that he took the drug. Then, he became remorseful. Where were those thoughts before he cheated the rest of the cycling community? Anyway, he became the spokesman for not using drugs and the fans applaud him. Then you have Ivan Basso. He was implicated in Operation Puerto. He said that he didn’t dope, but had planned to. He spent his timeout. He’s quite now and just goes about his business of riding bikes. I guess the cycling public likes him alright. But, then Ivan’s sister, Elisa Basso, was charged in Italy last week with drug distribution along with a few other professional cyclists. Maybe she was only selling/distributing EPO for recreational use and not for sporting fraud, I don’t know. Do you think this will make the cycling public turn against Ivan? Two riders this past week, one from BMC and the other from Lance’s Radio Shack Team were positive. Two US teams. Thomas Frei was positive for EPO. He confessed today. Li Fuyu was positive for Clenbuterol. I’m not certain, but I’m pretty sure this is the first time that a current rider on a team with Lance has ever shown a positive drug test. And these guys weren’t smearing everyone. They were just getting by. It doesn’t seem to be getting better quick enough for me. So my question is, all the guys listed above pretty much broke the same rule. Probably for mostly the same reasons. But the public and media condemns some and welcomes others return. Everyone says that they don’t like Vino because he didn’t admit his usage. But, Virenque denied his guilt thousands of times and the public seemed to accept it. I think there might be some prejudice involved with Vino. Because Alexandre Vinokourov is from Kazakhstan, I think some people might not give him the same break. 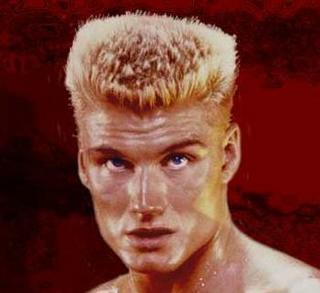 Plus, he looks a lot like Ivan Drago, the evil Russian guy that Rocky had to fight in Rocky IV. Whatever the reasons are, I think it is interesting. I guess the explanation is that each of us have our own criteria for who we like and who our favorites in the sport are. And those reasons differ a lot. Maybe Vino should just ride his bike and not talk so much. He probably would have more fans. Here’s a good spin on it from BikeSnobNYC. The sprint that never should of happened. Ricco, Vino, & Basso. Actually, one good reason to not like Vino was wearing that “Vino for ever” jersey during his comeback. I don’t know who could pull that off and still be a fan favorite. i’m a little confused. so, do you think the people that dope should be banned from racing BUT they might be OK people? the reason i ask is that you talk about adam bergman all the time and he doped. It isn’t relevant whether I like this people or not. Most every bike racer I’ve met are nice guys. Adam is a great guy. Floyd is super nice. I’m sure David Millar and Ivan Basso are cool. I just don’t think that they should be racing bikes anymore. There are so many hardships in bicycle racing, and sports in general, to allow any leeway in drug usage. It steals life memories from the athletes along with everything else that comes along. Plus, it ruins a important part tof what makes sports special. Doing things that seems super human are what makes athletes special. It’s not special at all when drugs are involved. Exactly the opposite. thanks for the response and ethics – i appreciate it!